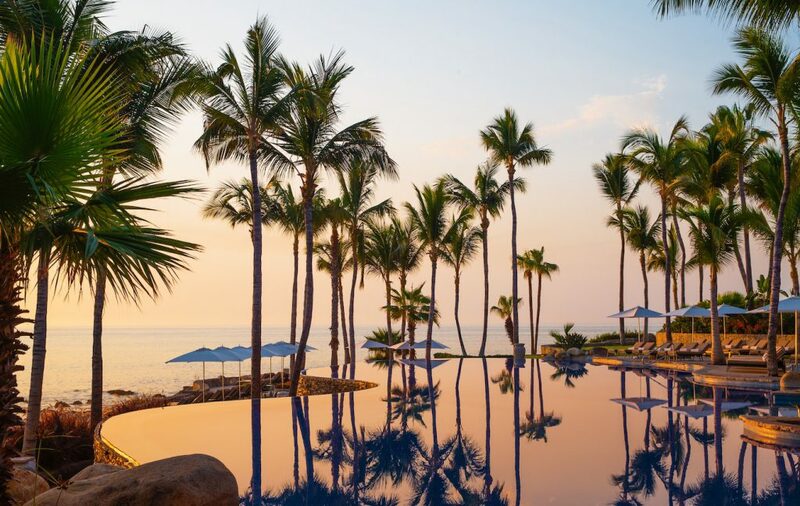 A continuous favorite among celebrities and the jetset, it’s no surprise that One&Only Palmilla frequently finds itself topping travel award lists. With top-notch security and service as pristine as its sparkling pools, no request goes unanswered, leaving each guest treated like royalty. The resort is home to two completely different beach experiences. One side offers a restaurant, beach bar and calm water perfect for non-motorized water activities such as stand-up paddle boarding, kayaking, snorkeling and boogie boarding while the other side, despite not being swimmable is more secluded and private, complete with full beach service, loungers and hammocks. Two infinity-edge pools, one for families and one for adults only that includes a swim-up bar, also provide separate experiences. Fun Fact: The resort lights more than 1,200 candles and fire pits each night around the property. The task takes one to two hours to complete and starts before sunset. 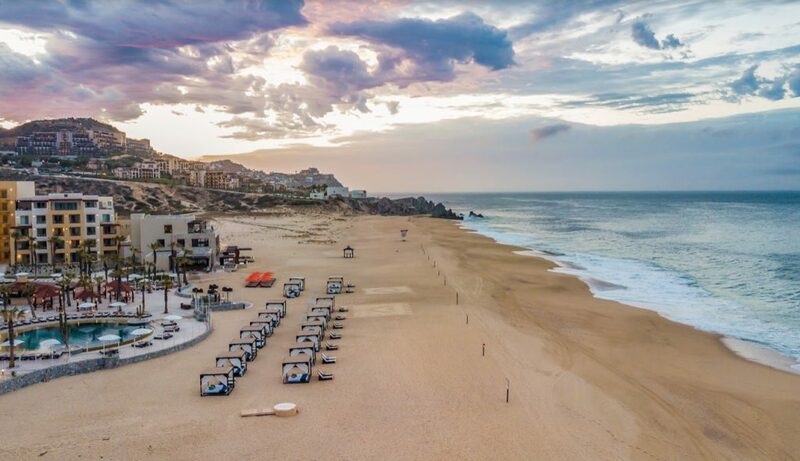 As the only private beach resort in Cabo, Esperanza is a great place for wine, romance and one-of-a-kind culinary experiences. The newly renovated Cocina del Mar restaurant, complete with flickering lanterns in a cliffside setting, is just the beginning of the enchanting atmosphere. With a barefoot elegance, the family-friendly resort is surrounded by stunning rock formations and has two private coves of golden sand. One is home to an adult-only, infinity-edge pool complex while the other offers a more secluded and quiet area for all-day sun soaking. 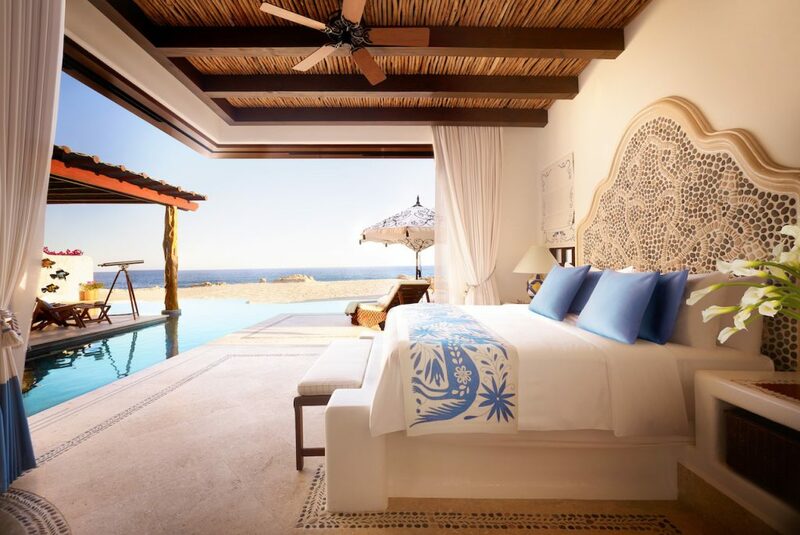 Breezy accommodations include original Mexican artwork, canopy beds, private infinity-edge hot tubs and views of the Sea of Cortez. Fun Fact: There are two private two-story Bungalows on the beach available to rent out for the day, complete with a dining area, a swing, chaise lounges and a daybed on the second level that’s equipped with a BOSE Bluetooth speaker. After traveling through the only privately-owned tunnel in Mexico, you’ll arrive at The Resort at Pedregal, who’s currently celebrating their 10-year anniversary this year. Home to one of the most romantic restaurants in Mexico, El Farallon, and nestled into the rocky cliffs, this resort is one you won’t want to leave. All accommodations include a private plunge pool and the celestial-inspired Luna y Mar is our top pick for the best spa in Mexico. In fact, the spa and resort were both recently awarded a Five-Star designation by Forbes Travel Guide, making the resort the only one on the Pacific side to boast the dual recognition. Fun Fact: A 4 p.m. delivery of chips, guacamole and beer is a favorite amenity among guests. While The Cape is located just 10 minutes from downtown Cabo San Lucas, the hotel has everything you could need and more for a glam night. Designed with 1960’s Southern California in mind, the hotel attracts a younger crowd and exudes an upscale, laid back party vibe. Whether it’s a fun trip with your special someone or a bachelorette party weekend, The Cape is where to see and be seen. 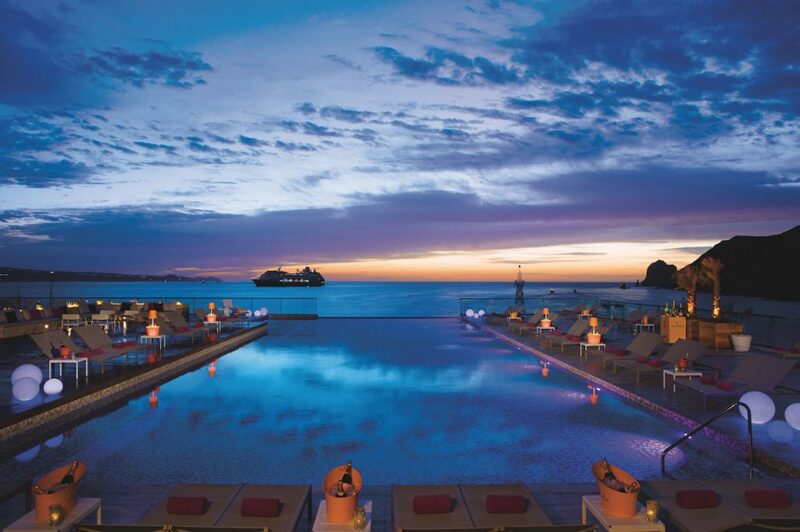 Not to mention, the hotel is home to one of the best rooftop lounges in Cabo San Lucas. Fun Fact: A visit to The Cape is incomplete without an order of the nutty and sweet Banana French Toast at The Ledge. A total fan-fave among guests and staff, the rich, doughy treat is soaked in coconut milk and accompanied by roasted bananas, vanilla cream and almonds. 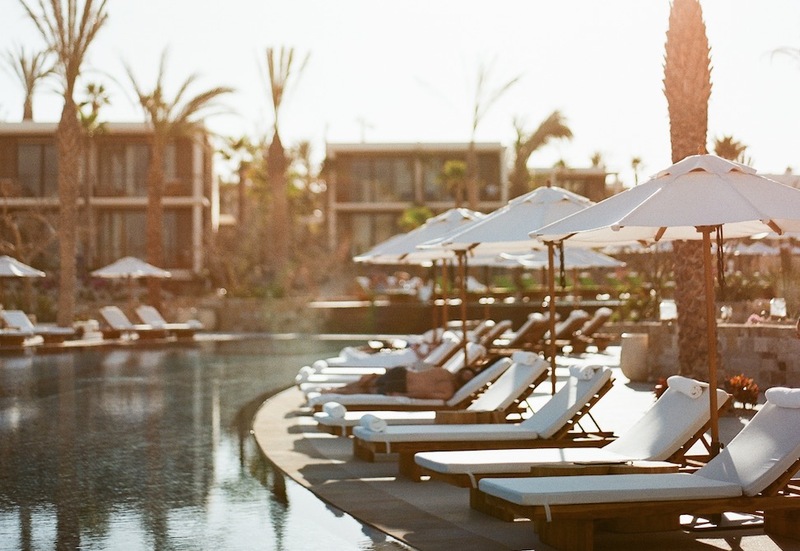 Forget traditional Mexican design when stepping foot into Viceroy Los Cabos. Debuting just last year, it’s already racked up a handful of awards in the short time it’s been open. Most recently it was voted the No. 1 Resort in Western Mexico and No. 2 Resort in the World in the 2018 Condé Nast Traveler Readers’ Choice Awards. The architecturally stunning property was designed by Miguel Angel Aragonés and is a dreamlike retreat where shades of blue and white reflect off glass-like waters. With buildings and paths that appear to float, a nest-like restaurant and minimally decorated rooms, this hotel is like no other in the Baja. Located just 10 minutes from downtown San Jose del Cabo, it’s conveniently positioned for travelers to experience the town’s vibrant culture. 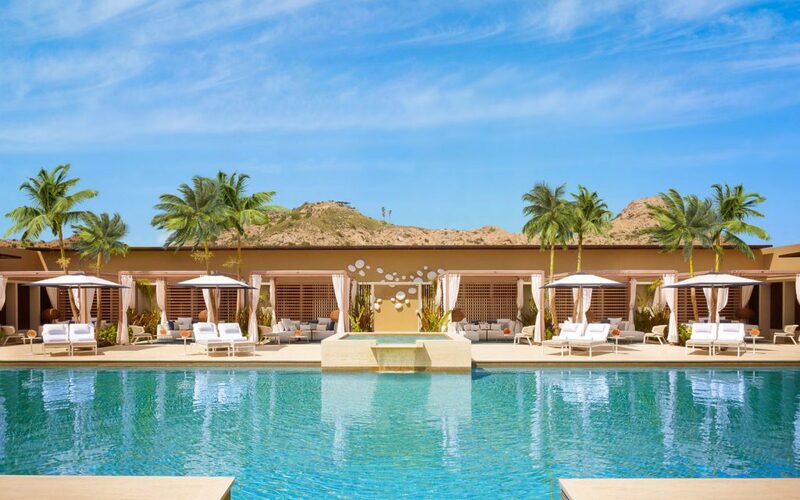 On site, guests can enjoy four pools, including one rooftop; five dining outlets; a fully renovated spa; and a high-tech fitness center curated by celebrity fitness guru Harley Pasternak. 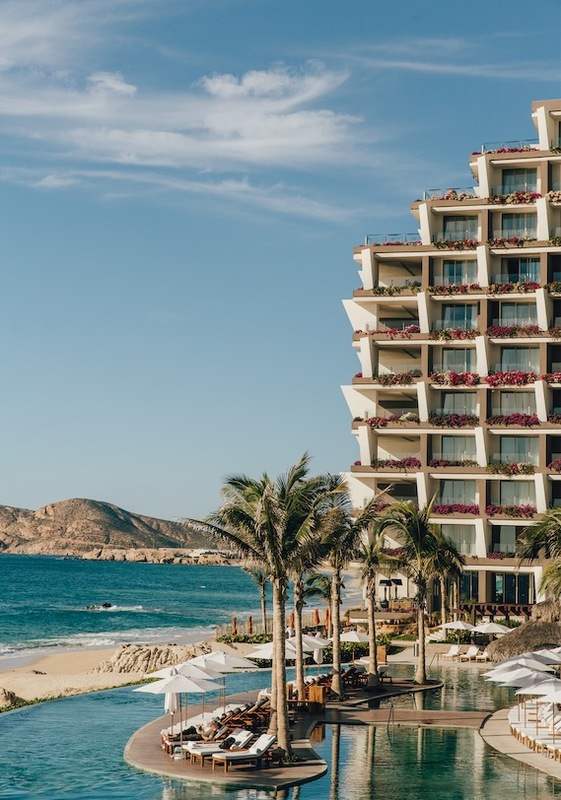 Fun Fact: Fans of the Tulum boutique KM33 can now shop the popular linen dresses, python purses from Ilka, straw hats from Alpa, irresistible jewelry and more at Viceroy Los Cabos where they’ve just opened a new location. This beachy destination caters to resort guests with a younger attitude and playful flair. Clean contemporary architecture and an earthy, desert-meets-sea color palette play up the simple yet sophisticated feel of this energetic resort. Rooms feature outdoor showers, high-tech amenities, private terraces and ocean views. The real stunner is the 150-yard, zero-edge, three-tiered pool, lined with private poolside bungalows, swim-up cabanas and plush chaise loungers. The sparkling amenity cascades down to the sandy shorefront and one of Cabo’s only swimmable beaches. If that doesn’t completely win you over, its signature restaurant COMAL will definitely do the trick. Think spicy margaritas, melt-in-your-mouth sushi and an electric vibe. Fun Fact: The resort’s Sky Villa penthouse has a 2,000-sq.-ft. private rooftop with its own plunge pool. Owned by business tycoon Ty Warner, this palatial resort is home to one of the most expensive rooms per night, the Ty Warner Mansion. Even if you can’t afford the $35,000 price tag attached to the mansion, the other rooms are nothing less than impressive. Book a beachfront villa for the ultimate in indoor-outdoor living with a private infinity-edge pool and a Jacuzzi. The resort recently debuted its Oasis Pool & Lazy River complex and Arbol, an exotic Asian restaurant combining the flavors of India and the Far East. Las Ventanas also specializes in romance and are experts at creating exquisitely designed greetings in the sand along with offering sunset dinners, oceanfront movies, custom firework displays and more. Fun Fact: The resort has 650 associates that help make the dreamy property what it is. Montage Los Cabos is located within the Twin Dolphin community and is designed to optimize views of the desert landscape and Sea of Cortez. Perfect for those looking to get their feet wet, the resort has walk-in access to swimming, diving and snorkeling. 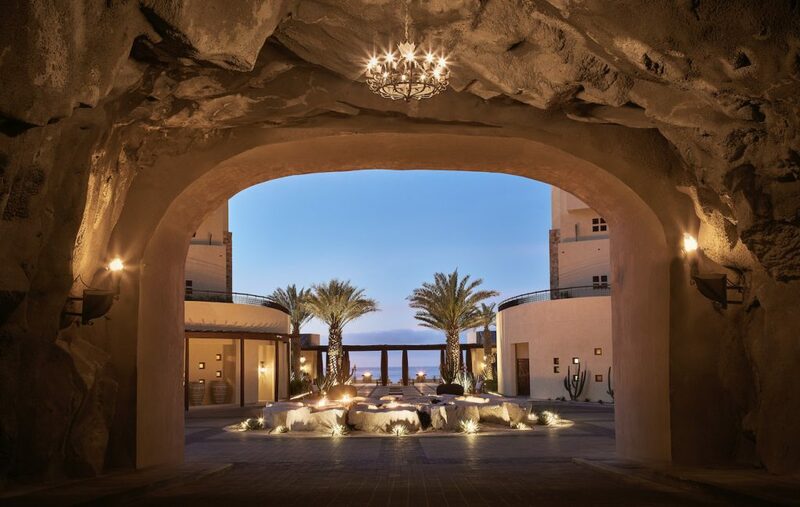 Accommodations include rooms, suites, residences and casas and all feature a contemporary design with desert-toned hues, terraces with daybeds and outdoor showers. 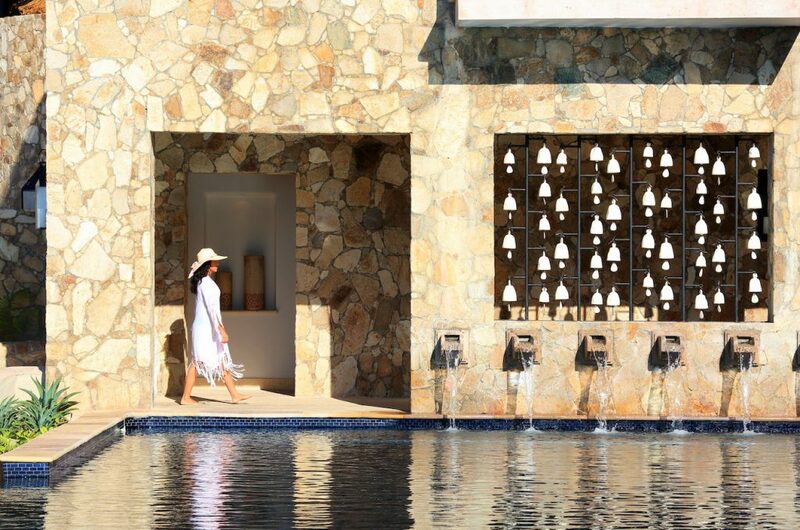 Resort amenities include the signature Spa Montage, three pools, two tennis courts, four dining options, access to the Twin Dolphin Golf Course and the brand’s signature children’s Paintbox program. Fun Fact: Past guests include top model Alessandra Ambrosio and her family. Guests at Solaz will be greeted by a world of authentic Mexican art from famed Mexican artist César López Negrete, who’s spent years traveling and studying the Baja’s landscape. The resort itself also stands as a piece of art. 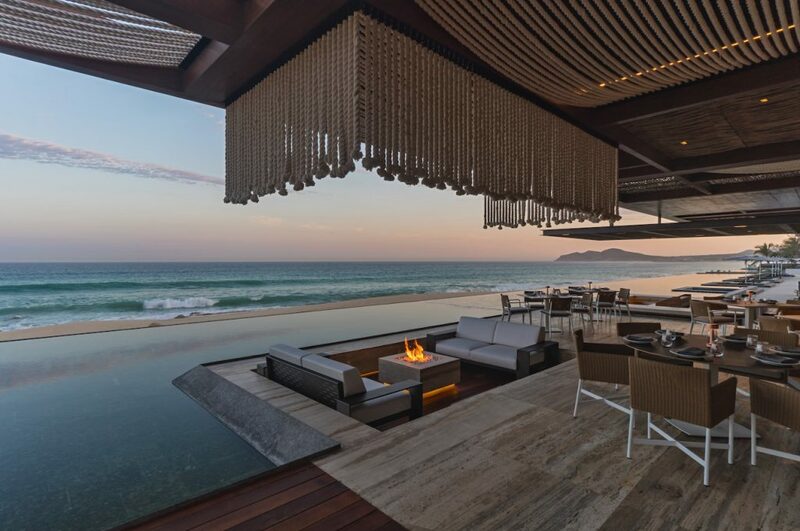 It was designed by renowned Mexican architectural firm Sordo Madaleno and blends desert vegetation with quarry stone, granite, marble and wood, to create a cascading terrace. Take a dip in one of the five swimming pools or unwind at Ojo de Liebre Spa, the only Thalasso wellness spa in Baja. Fun Fact: An on-property museum features five exhibit areas with regional artifacts like a 43-ft.-long whale skeleton, a historical map collection and more. Newly renovated accommodations feature a bright design, while rooms at La Vista Club offer premium amenities, top floor location, access to La Vista Lounge and poolside butler service. Snap a picture on one of the bright-colored hanging swings at the Mio sushi bar or select your fresh catch at the sea-to-table El Meson. Eforea Spa offers treatments using native Mexican rituals, and a Living Wall where guests can pick natural herbs to customize their experience. Additional amenities include a modern Technogym fitness center and Movement Studio. Fun Fact: The Azul lobby bar is home to Los Cabos’ largest tequila selection. 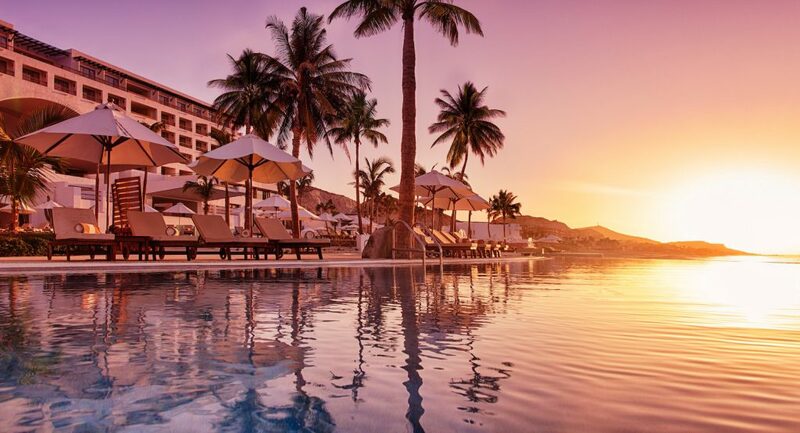 Six miles from downtown Cabo San Lucas is the Mediterranean-inspired Sheraton Grand Los Cabos Hacienda del Mar on private Tortuga Beach. The resort features five pools, each with a distinct ambiance and varying amenities like Pitahayas Pool with live bands and fun activities or Delfines Pool that winds through the resort and has a dedicated kid’s area. 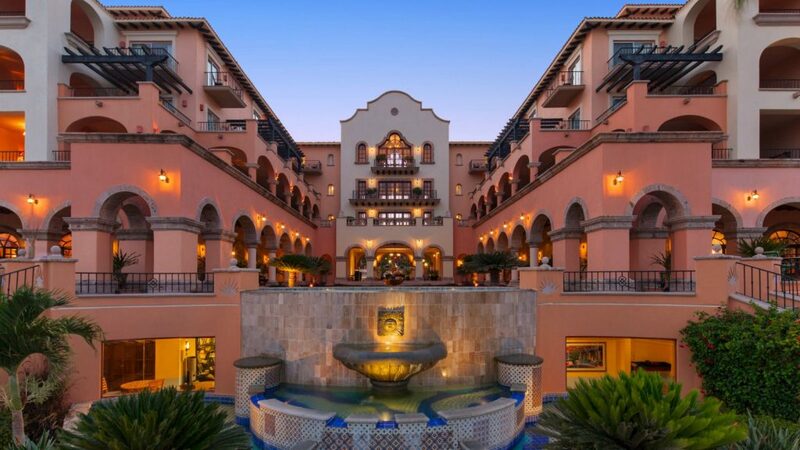 Guests of Sheraton Grand have easy access to two championship layouts at the nearby Cabo del Sol golf resort and the on-site hacienda-style Cactus Spa features a variety of tailored massages, body treatments, skin care and salon services. Accommodations feature an Old Mexico style with private balconies while dining options range from oceanfront Mediterranean to upscale Pacific Rim cuisine and more. 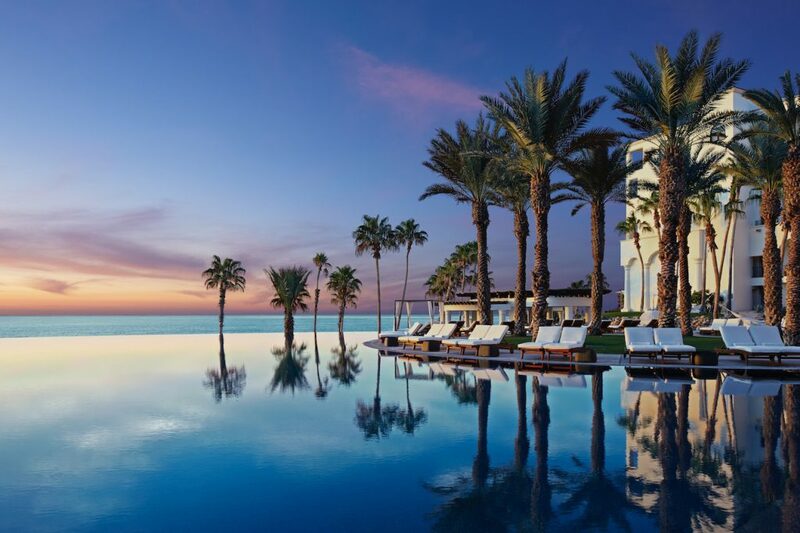 Continuously at the top of the best all-inclusive lists, Grand Velas’ most recent venture in Cabo has proved itself a must-visit. 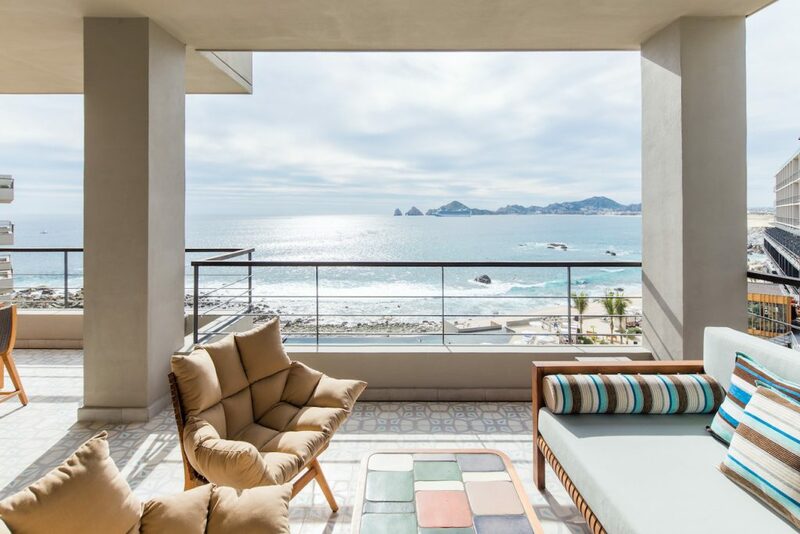 The resort is home to unique culinary features like a $25,000 taco (the world’s most expensive, by the way) at its signature Frida restaurant, daily in-suite deliveries of fresh churros, a wine-lovers over-the-top getaway via private jet to Ensenada, do-it-yourself insuite taco bars and more. It’s also the perfect family retreat with kid-approved activities, classes and amenities. For an easy getaway of sunshine and relaxation, book a stay at adults-only Marquis. Every room here comes with an ocean view and is centrally located around the stunning three-tier pool, which stretches out from under a 40-ft. cascading waterfall. Be sure to get a taste of one of their seven different mouthwatering ceviches, each reflecting a different region throughout Mexico and South America. In the center of all the Medano Beach action is Breathless, an adult-only retreat with a “mix-and-mingle” vibe. Lush accommodations feature a private balcony or terrace with marina and ocean views. By day, enjoy DJ-hosted pool parties while nighttime brings live music, dancing, parties, shows and more. Chic dining options include international fare and cool cocktails and those looking to recharge, can visit Relax Spa by Pevonia. The secluded setting of this adults-only resort adds an extra level of all-inclusive romance. Luxurious rooms include a private furnished balcony, terrace or even swim-out pool with stunning views of the beachfront location. Five gourmet a la carte restaurants provide a bevy of cuisine options and the Secrets Spa by Pevonia offers an array of relaxing treatments. Guests can keep busy with a variety of day and evening activities like theme parties, a nearby championship golf course and more. 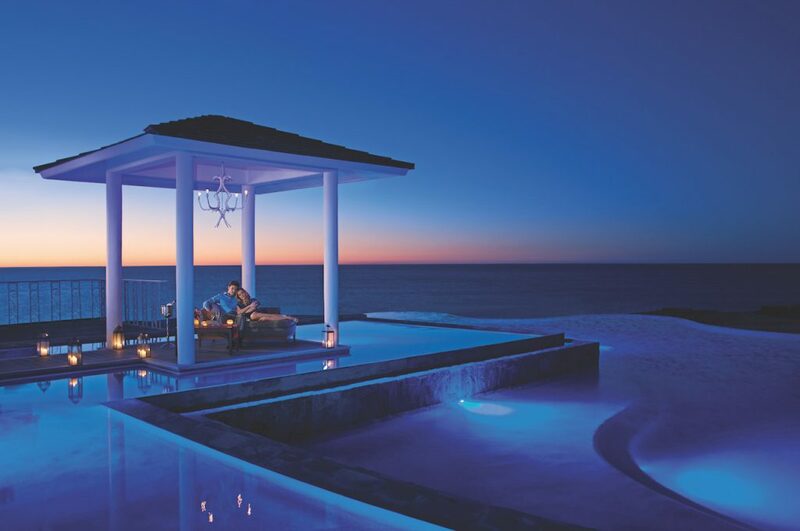 As part of the privileges of Unlimited-Luxury, guests have the option to Sip, Savor & See at nearby Breathless Cabo San Lucas Resort & Spa and Dreams Los Cabos Suites Golf Resort & Spa. 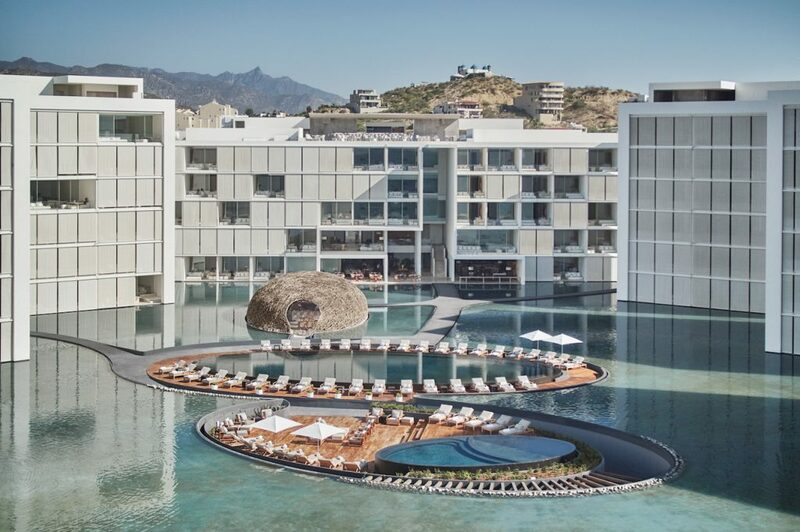 After celebrating its Cabo debut in March 2018, Le Blanc Spa Resort has done nothing but exceed expectations. The upscale adults-only hotel has butler service on every floor and no shortage of dining options. Eight restaurants and six bars offer an array of indulgent variety, while four sparkling pools, a spa with hydrotherapy facilities and daily activities and nightly entertainment mean there’s always something to do. In-room amenities include BVLGARI products, CHI blow dryers and flatirons and a bath salt, aromatherapy and pillow menu.